The benefits of producing knowledge are hard to appropriate because knowledge spills over to other firms in the economy. Spillovers are a good thing as far as they help companies learn about state-of-the-art knowledge from other companies and so become more efficient themselves. The problem is, however, that the incentives to invest in knowledge production are too low if the benefits accrue to many, but the costs are borne only by the innovator. This is one reason why governments support research and development (R&D) by tax credits or direct subsidies. The optimal size of R&D subsidies depends on the size of the knowledge spillovers. How much do companies learn from each other? Recent studies suggest that they learn a lot. Bloom et al. (2013) find in a sample of established companies that the social return of R&D is two to three times the size of the private return of R&D. They also report that large enterprises generate more spillovers than small businesses, presumably because small firms tend to operate in technological niches. This finding is surprising, because it implies that small companies should be subsidised less than big businesses. This is the opposite of the intuition of researchers and practice of policymakers. In a recent paper, we measure the knowledge spillovers for one type of small businesses that is commonly thought to be particularly innovative and important for economic growth – venture capital-backed start-ups (Schnitzer and Watzinger 2017). We need to understand the contribution of start-ups to successful innovation in other companies via spillovers if we are to determine whether, and by how much, a government should support venture capital investment (Lerner 2009). Measuring knowledge spillovers between companies is a challenge. Knowledge spills over when scientists from different companies meet and exchange ideas, when researchers learn from scientific publications, or when a company reverse engineers another company's product. These activities are typically non-observable. To quantify these spillovers, we follow previous research and identify, for each company, the set of other companies – the spillover pool – that could potentially influence that company's innovation process. Then we measure the co-movement of this company's innovation with the R&D investment of the companies in its spillover pool. We use the correlation to quantify the spillovers between the companies. The crucial modelling choice when using this method is how to determine which companies belong to the spillover pool. The traditional method has been to consider the companies with patents in the same technology classes (Jaffe 1986). Bloom et al. 2013 extend this concept by also including companies that work in “similar” technologies and call this new measure the Mahalanobis proximity. According to this measure, two technologies are characterized as similar if companies often hold patents of the two corresponding patent classes together in their patent portfolio. Patents about robotics and artificial intelligence, for example, are complementary and therefore collocated in companies.The underlying assumption is that knowledge flows mainly within technological fields. But we know that successful innovations often recombine ideas across technological boundaries (Weitzman 1998, Uzzi et al. 2013). If we limit attention to companies within the same technology we might miss many spillovers, especially those leading to more radical innovation. Therefore we develop a new method that combines information on a firm’s technology with information on the closeness of different technologies, based on patent citations. We calculate a matrix of all patent citation flows between technology classes and used it to determine the relevant pool of companies likely to be affected by spillovers. Figure 1 shows the share of cross-citations between patents in different technology classes. Our new measure enlarges the group of companies considered relevant for producing spillovers by including companies that are not active in the same technology, but are active in related technologies. Source: Schnitzer and Watzinger (2017). In contrast to previous approaches, our measure takes the direction of knowledge flows into account. While biotech patents cite patents from metalworking, metalworking patents do not cite patents from biotech. This means we are able to capture spillovers from science-based start-ups that are active in basic upstream technologies to established companies that are active in applied downstream technologies (Acemoglu et al. 2016). Using this new methodology, we estimate the spillovers that arise from venture capital investment in start-ups, and compare them to spillovers from R&D investments in established companies. We use data from the Harvard Patent Dataverse, Compustat and VentureXpert. Our results suggest that the knowledge spillovers from VC-financed firms are at least nine times larger than the spillovers from corporate R&D. Increasing venture capital investment by $1 million yields (in our preferred specification) 0.33 patents of average quality. Two-thirds of this increase can be traced to more patenting by other companies. In particular, large established companies benefit from the ideas of technologically close start-ups. Our analysis allows us to paint a nuanced picture of venture capital-induced spillovers from start-ups. We find that spillovers re stronger in industries that use a 'complex' product technology than those that use a 'discrete' product technology. Complex products, such as computers, need the input of numerous separately patentable elements, while discrete products, such as drugs, require only a few of such inputs. 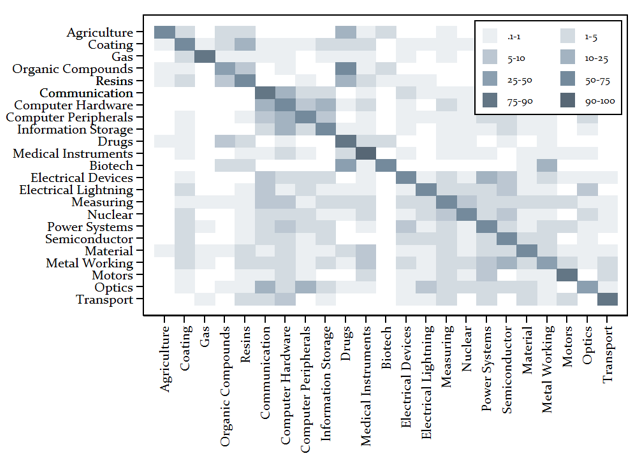 Spillovers may be lower in discrete product industries because in these industries patent protection is a more effective appropriation mechanism than in complex product industries (Cohen et al. 2000), which limits the potential for spillovers. The spillovers generated by venture capital vary by the type of start-up receiving the investment. We find that spillovers are stronger for start-ups with an experienced inventor team, but only if they have a patented technology at the time they receive their first round of investment. This sheds light on the importance of the founder team, and its prior experience for the success of a venture. There are two hypotheses for why prior experience might matter. The 'skills' hypothesis emphasises that a previous affiliation with a start-up may help entrepreneurs learn how entrepreneurship works. The 'commercialisation' hypothesis stresses that prior experience in established firms, or affiliations with universities, helps them get access to technologies (Gompers et al. 2005). Our results imply that spillovers re highest when start-ups employ venture capital for the commercialisation of their technologies, which supports the commercialisation hypothesis. Our research highlights that venture capital-financed start-ups play a significant role in the innovation system, generating large positive spillovers to other companies. This result suggests that subsidies for venture capital investment should be at least as large as current R&D subsidies. Experience and access to technology matter for how much other businesses can learn from start-ups, and thus how beneficial venture capital investment is for the innovation system. This complementarity between the supply of venture capital on the one hand, and the supply of technology and experience on the other hand, should inform policies on how to boost innovation and economic growth. Acemoglu, D, U Akcigit, and W R Kerr (2016), "Innovation network." Proceedings of the National Academy of Sciences 113 (41): 11483-11488. Bloom, N, M Schankerman, and J Van Reenen (2013), "Identifying technology spillovers and product market rivalry", Econometrica 81(4): 1347-1393. Cohen, W M, R R Nelson, and J P Walsh (2000), "Protecting their intellectual assets: Appropriability conditions and why US manufacturing firms patent (or not)". National Bureau of Economic Research Working Paper No. w7552. Gompers, P, J Lerner, and D Scharfstein (2005), "Entrepreneurial spawning: Public corporations and the genesis of new ventures, 1986 to 1999", The Journal of Finance 60(2): 577-614. Jaffe, A B (1986), “Technological Opportunity and Spillovers of R & D: Evidence from Firms' Patents, Profits, and Market Value”, The American Economic Review 76(5): 984–1001. Lerner, J (2009), Boulevard of broken dreams: why public efforts to boost entrepreneurship and venture capital have failed--and what to do about it, Princeton University Press. Schnitzer, M, and M Watzinger (2017), "Measuring the spillovers of venture capital." CEPR Discussion Paper 12236. Uzzi, B, S Mukherjee, M Stringer, and B Jones (2013), "Atypical combinations and scientific impact." Science 342(6157): 468-472. Weitzman, M L (1998), "Recombinant growth", The Quarterly Journal of Economics 113(2): 331-360.